Join us on Friday, June 21! 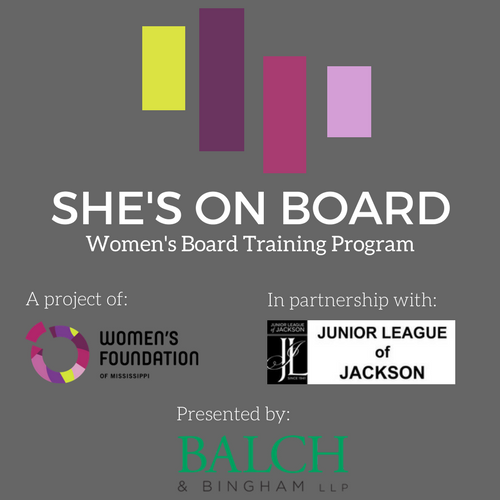 The Women's Foundation of Mississippi, in partnership with the Junior League of Jackson, is proud to offer this leadership program for ALL Mississippi women interested in board service! This event returns for a second year after a highly successful launch in June 2018. This board governance and training program will give women the tools they need to succeed and lead in the boardroom. Please join us on June 21, for a day long training! We will have excellent speakers who will cover all aspects of board service including the duties/responsibilities of a board member, an introduction to non-profit finance, things to consider before joining a board, and a panel discussion about different paths to leadership. Deadline to register is Thursday, June 13, 2019. Scholarships are available. Please contact Frances Croft at frances@womensfoundationms.org for more information.